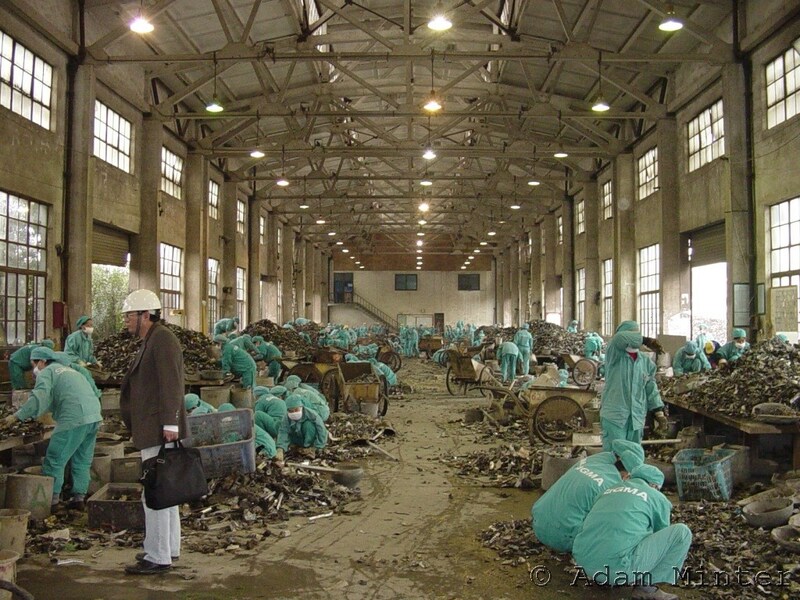 Starting today, through the November 12 release date of my first book, Junkyard Planet: Travels in the Billion Dollar Trash Trade, I’m posting a new photo taken during my decade of reporting on the global waste, recycling, refurbishment, and repair trade. At the end of the three months, I hope you’ll have a better visualization of what, precisely, this massive industry looks like from the perspective of someone who’s traveled widely in it. Late morning, October 29, 2002, I walked into a warehouse in Shanghai’s Baoshan District and snapped this photo. I’d been to plenty of US scrapyards, but this was my first Chinese one. The workers were sorting bits of shredded US and EU automobiles; next door, furnaces were melting the sorted aluminum into new aluminum for export to Japanese car manufacturers. In the years since I took this photo, this factory, this industry, and my understanding of it, have evolved considerably.